Scientists say they have the best evidence to date pinpointing the substance in grapefruit that can interact dangerously with some drugs. Grapefruit is known to increase the rate at which some drugs - including cholesterol and blood pressure medications - enter the blood stream. It was thought the flavonoids that make grapefruit taste bitter were to blame. But a US study in the American Journal of Clinical Nutrition suggests other chemicals - furanocoumarins - are key. The drugs affected by grapefruit juice usually have some difficulty entering the body after they are consumed because an intestinal enzyme partially destroys them as they are absorbed. Grapefruit juice, but not other commonly consumed fruit juices, inhibits this enzyme, allowing more of these drugs to enter the body. As a result, grapefruit juice is avoided by some patients while others deliberately take their drugs with the juice. A team at the University of North Carolina at Chapel Hill tested the theory that furanocoumarins, and not flavonoids, were to blame for inhibiting the enzyme. They compared the effect of standard grapefruit juice with a version from which furanocoumarins had been removed. Volunteers were given 10 milligrams of felodipine, a drug used to treat high blood pressure, washed down with either orange juice, regular grapefruit juice or grapefruit juice devoid of furanocoumarins. Blood tests showed that only regular grapefruit juice interacted with the absorption of the drug. Lead researcher Dr Paul Watkins said: "This is the best evidence to date that furanocoumarins are the active ingredients in grapefruit juice that cause the interaction with medications. "We found that removing the furanocoumarins from grapefruit juice entirely got rid of this interaction." Dr Watkins said it should be possible to market furanocoumarin-free grapefruit juice to patients who would otherwise need to avoid grapefruit. It should also be possible to screen new foods for the potential for drug interactions by determining whether they contain furanocoumarins. "Finally, it may be possible to add furanocoumarins to formulations of certain drugs that tend to be poorly or erratically absorbed to improve their oral delivery," he said. 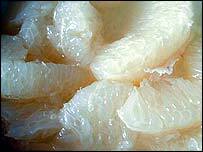 Belinda Linden, of the British Heart Foundation, said furanocoumarins were found in high amounts in grapefruit juice. She said: "If further research identifies and extracts this chemical from grapefruit in the future, everyone may be able to enjoy eating grapefruit and benefit from its antioxidants. "Until then, people who take statin drugs or certain other medicines should not consume grapefruit."